Feb. 24, 2012 -- Could blind, buck-toothed, finger-sized naked mole-rats harbor in their brain cells a survival secret that might lead to better heart attack or stroke treatments? University of Illinois at Chicago biologist Thomas Park and colleagues at UIC and the University of Texas Health Science Center at San Antonio think the subterranean lifestyle of these nudist rodents may hold clues to keeping brain cells alive and functioning when oxygen is scarce. The key may lie in how brain cells regulate their intake of calcium. "Normally, calcium in brain cells does wonderful things, including forming memories," says Park, who is professor of biological sciences at UIC. "But too much calcium makes things go haywire." Brain cells starved of oxygen can't regulate calcium entry, and too much calcium in the cell is lethal. When a heart attack or stroke prevents oxygenated blood from reaching the brain, brain damage or death results. Naked mole-rats, however, are very tolerant to oxygen deprivation, or hypoxia -- as are human newborns, whose brain cells have calcium channels that close during oxygen deprivation, protecting the cells from calcium overdose. With age, these calcium channels no longer close, which normally isn't a problem -- except during a heart attack. Naked mole-rats retain a tolerance for oxygen deprivation into adulthood. Park and his colleagues measured calcium entry in brain tissue that had been kept under oxygen-poor conditions, reporting their findings online in PLoS One. "We knew the adults of this unusual mammal had brains that, like infant humans, were very tolerant to oxygen deprivation," he said. 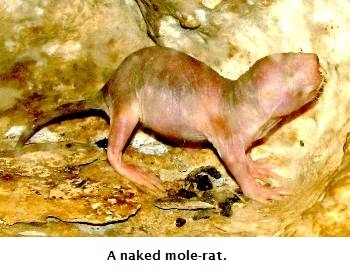 "We wanted to know if the adult naked mole-rats used the same strategy as babies to prevent calcium entry. This is exactly what we found." Park thinks this strategy is an evolutionary adaptation by mole-rats, which live in large colonies underground in tight, oxygen-deprived conditions. "Imagine 200 mice living in a shoe box buried four feet under the ground -- things are going to get bad fast," he said. The researchers think they have identified a new mechanism for protecting the adult brain in times of oxygen deprivation. "Developing this target into a clinical application is our next goal," he said. "We need to find a way to rapidly up-regulate the infant-type of calcium channels. Adult humans actually have some of these channels already, but far fewer than infants." Park, who for years has studied naked mole-rats thinks the latest findings are just the tip of the iceberg of what we can learn from the rodents. Their homes are not only oxygen-poor, but rich in carbon dioxide and ammonia -- conditions that would make most animals ill.
"The more we study these creatures," said Park, "the more we learn."